More than just acting Resilient. Resilience and renewal are two words that could be directed at any aspect of our society at the moment. Put them in the context of our banking system, political system, health service, universities and churches and they would not prove in the least ambiguous or out of place. Here, they refer to an upcoming appraisal of Ireland’s theatre sector, one area that is bravely battling to buck the trend of being another economic victim. 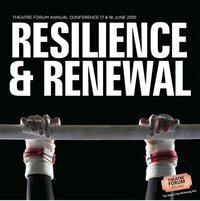 Theatre Forum, the independent group that represents, supports and develops theatre and performing arts practitioners in Ireland is hosting its annual conference at the magnificently refurbished Wexford Opera House from 17-18 of June 2010. The now annual Theatre Forum conference is one of the major fixtures in the Irish theatrical calendar and is an event that brings so many of Irelands arts and theatre community together to discuss and evaluate what is good, what is right and what needs attention and redress in Irish theatre. This year the panel of speakers includes Loughlan Deegan, Director of the Dublin Theatre Festival, Willie White, Artistic Director of the Project Arts Cente, Una McKevitt, director of recent Fringe favourite Victor and Gord, Lynette Moran, co-organiser of Project Brand-New, Una Carmody, Chief Executive of the Helix theatre and Grace Dyas, actor, director and playwright. The conference is curated by Anne Bonnar who is founding director of the National Theatre of Scotland. Some of the key themes of this year’s conference can be viewed at the Resilience and Renewal blog page here. It is relieving to see that economic hardship and funding cuts, while obviously important and necessary to be discussed, are not top of the agenda. The focus is very much on the continued development of new and exciting digital theatre, audience interaction and development of new and emerging Irish playwrights and companies. Lyn Gardner’s blog at The Guardian where she argues that the genuine interaction in work by companies like Blasttheory and Hide and Seek “changes the contract between artists and audiences”. Other companies such as The Company are exploring the possibilities and methods to further dismantle this ‘contract’ by challenging ways of truly communicating to an audience as well of including them. In future, the relationship between and interaction between the cast, the audience and digital elements, which all contribute to reduce the boundaries of traditional theatre spaces and conventions and allow for an expansion of the experience by an audience and also creates new possibilities in the development of new and unexplored performance spaces. This conference should go a long way to creating an awareness that a quality artistic and theatrical-focused response to economic collapse can be a vital resource to a country that is trying to stand up despite the enormous weight of previous mismanagement. Cultural tourism is simply essential to rebuilding an exportable ‘Brand Ireland’ that is already recognized world-wide. This development has to start nationally and aim globally. A healthy theatre sector in Ireland needs to be able to concentrate on artistic and audience development and to get beyond the battling. Resilience and renewal indeed. Some other key questions that will be addressed in Wexford will be how can we break through the barriers of disinterest, language and even prejudice to engage more and more with diverse audiences? How do we ensure that 21st century Irish theatre is really relevant to society that is facing a reality that wasn’t imaginable two years ago. What sort of business models will work for theatre and the arts now that there is simply less and less funding and money available? How do we sustain ourselves, our artists and premises that fight on our behalf? What can one hope to come from this conference? Obviously not miracles. Culture and theatre is but one aspect of a hugely diverse sector of the Irish economy. Questions will be asked, not all will or perhaps can be answered. What may be most important is to come away with a clear direction and vision on how Irish theatre will challenge Irish societal issues and remain relevant. Maintaining an interested and engaged audience will warrant real resilience but it’s certainly worth fighting for.